New partnership enables leading UK provider of Video and Collaboration solutions to add 8×8 cloud-based voice and UC solutions to portfolio. 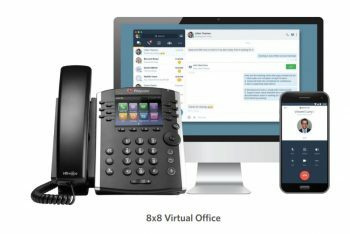 Reading, United Kingdom, October 02, 2018 – VideoCentric, the UK’s leading integrator of Video Collaboration solutions and professional services, and 8 x 8 Inc (NASDAQ:EGHT), a leading provider of cloud phone, meeting, collaboration and contact centre solutions, have today announced a partnership that will provide enterprise-grade cloud communications and voice collaboration solutions to UK SMB and Enterprise companies. The partnership expands VideoCentric’s extensive cloud collaboration portfolio to provide organisations access to 8×8’s industry-leading cloud-based UC and voice solutions. 8×8 X Series offers an integrated cloud platform for communications and contact centre to over a million business users worldwide, and has been named leader within the Gartner Magic Quadrant for Unified Communications as a Service (UCaaS) for the 6th year running. UK headquartered VideoCentric, who has been providing cloud-based video services to the UK market since 2007, says it has selected 8×8 as its UCaaS partner of choice due to its innovative and best-of-breed offering, global reach and the entirety and simplicity of the 8×8 solution. “We are excited to be able to provide our customers with access to one of the most established and reliable providers of cloud-based voice and collaboration solutions available in the market today. Working with 8×8, VideoCentric now have an entire portfolio of world-leading Video, Voice and Data technologies for organisations to consume from the Cloud”, commented Emily Shimell, Head of Customer Communications at VideoCentric Ltd.
For more information on the 8×8 X Series or to discuss how cloud communications can work your business, you can contact VideoCentric today on 0118 9798910. VideoCentric design, supply and install on-premise, private, managed, cloud and hybrid video based solutions for businesses in both the private and public sector. From SMB’s to multi-national enterprises, VideoCentric’s solutions include boardroom & meeting space fit-outs, Video Network deployment & Skype for Business integration, connected workplace services, desktop & remote working solutions, Video Conferencing for meeting rooms, lecture theatres, hospitals and courts, mobile & BYOD conferencing, and professional tools & services for business collaboration. With a full portfolio of video, collaboration & network solutions from the likes of Cisco, Polycom, Lifesize, Yealink, Pexip, Barco, Crestron, AMX, Revolabs and Bluejeans, VideoCentric provide organisations with high quality solutions that can help greatly reduce costs, improve efficiency & increase productivity across the workforce. Visit our website www.videocentric.co.uk to find out more or follow VideoCentric @VideoCentricLtd.